What a beautiful morning. The sun is rising earlier every day, and setting later in the evening. Every year at about this time, there is a day when something deep inside snaps and memories of spring passed come flooding into my conscious mind.This morning was that moment. The smell, the crisp cool air, the special glow of the early morning sun, and the chatter of the birds were shouting “Spring has arrived”! Next thing will be the placing of docks along the shore, launching of boats, and the phone dancing off the wall. In the mean time the dreams of that first get away keep increasing. The doors are open and the crowds are pouring in! Day 2 at he London Boat and Fishing Show. Yesterday was a busy day but I think that it will be even more hectic. Stop by at the Highland View’s booth and have a chat. The doors are open and the crowds are starting to arrive. It’s hard to post and talk so I hope that this post will make sense! Highland View is at booth 136 right in the thick of things, other resorts, tackle sellers, and more. This is a busy location a lot to see. If you are looking for something to do and are in the London area this is the place to be. Check out the link http://www.boatcottagefishingshow.com/main.htm . We are here, so stop by and have a chat and give me your best story, fish story that is. This is the place to be this weekend. Highland View Resort will be at the London Ontario Boat Fishing and Leisure show starting in a couple of days. Stop by and say HI and check out our specials for your Spring Fishing Trip, Summer Vacation or Fall Get-a way’s. Check out their website at http://bit.ly/w4bOjF . 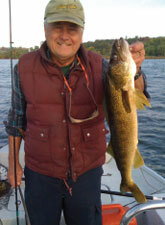 If you can’t get to the Toronto Sports man Show this is the perfect place to get the low-down on products and check out places to stay for your family vacation or get the scoop on the Rice Lake Spring Fishing Festival http://bit.ly/wLb0sh . What a beautiful day to celebrate the family. The weather could not be finer. If your looking for something to do check out the Spring Fishing and Boat Show at the Toronto International Center http://bit.ly/wzYEAv . Come over and join all the other families that are here. When your here come on over to the Highland View Resort Booth #1005. I would like love to talk to you about Fabulous Rice Lake and trade Fishing Stories with you. A great place to check out what is happening, and check out all the boats, fishing equipment, cottage resorts like Highland View Resort at booth 1005. (now that was shameless). There has been a lot of traffic here today and it is fun talking to all the folks young and old. Especially to those that I know. It’s a fantastic place to up date and share some of the stories of what has happened so far at the resort. Equally, talking and meeting new people, it sure helps make the time go faster. Come on down and stop over and say HI. I wasn’t dreaming or my ears were not playing tricks on me. I had to check it out this morning so when I went on my walk from Meadow View Cottage, I could see that there were about 25 geese between Prison Island and the channel just a honking away. There were in addition just off Serpent Mounds Point several people ice fishing. If you go out please be careful. If you check this link it will finally lead you to our rate sheet, http://bit.ly/yPlW0F I never expected that getting a new web site up and running would be as challenging. There is still more to come but I want to get the few remaining bugs worked out. Please, if you come across something that we have missed or is not working let me know. Out on the deck this evening I could the honking of geese somewhere in the back Of McGregor Bay. It is at least 4 weeks early.